The Daily GRRR! HEADLINES for Feb. 17, 2015. 1. Dine walkers conclude 225-mile “Journey for Existence” in New Mexico. 2. Chilean government pledges to make higher education free as of 2016. 3. Toronto group hosts their third annual Mapuche Solidarity Film Festival. 4. Don Cherry’s “savage” racism makes for a colonial Hockey Night in Canada. 5. Shots fired at Muslim school in Montreal under hate crime investigation. 6. WLU Muslim Students Association organize vigil for Chapel Hill victims. 7. UW Students for Palestinian Rights host Israeli Apartheid Week 2015. Welcome back to SoundFM! You are now listening to The Daily GRRR! on the air every weekday morning from 9-10 a.m. here at 100.3fm, CKMS in Waterloo, Ontario, and SoundFM.ca on the web. This is Kathryn and I’ll be your host on this Monday morning show for February 17th, 2015. 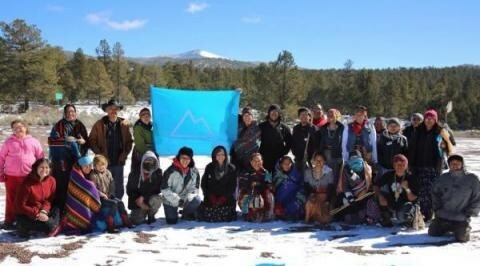 As reported by Indian Country Today Media Network, on February 1, 2015, the walkers ofNihígaal Bee Iina(pronounced ni-hi-gahl beh ee-nah, meaning "Our Journey for Existence") completed their quest to walk over 200 miles in the name of their children, land and ancestors. The walk was in commemoration of the 150th anniversary of The Long Walk, whereby over 9,500 Diné (Navajo) were marched at gunpoint for hundreds of miles into Bosque Redondo—a concentration camp where they would stay for four years. Only 7,304 survived the internment to return back to Diné Tah, the original Navajo homeland. In addition to honoring the resilience of their ancestors, the walkers also set out to raise awareness about issues surrounding oil and gas extraction in Diné Tah. Ultimately, the group walked the entire span from Dził Naa’oodiłii (Huerfano Mountain) to Tsoodził (Mount Taylor) in 26 days, a total of 225 miles. According to the walkers, their journey leading up to Tsoodził was full of sobering experiences. Along the way they spoke with children in Lybrook, New Mexico whose schools had been shut down due to water contamination from surrounding oil wells. At another point they walked along miles of idle cars that were held up due to a gas tank explosion. One young woman they met reported that she could no longer run alone in the evenings because of the countless oil and gas workers that pepper the land. As reported by the critical news site Attn.com, Chilean President Michelle Bachelet has made overhauling the nation’s education system a key goal of her administration. In early December, following approval of a corporate tax hike that will generate $8.2 billion in new revenue, Chile’s Minister of the Interior proclaimed, “In March 2016 we will start with free higher education now that we have the resources.” To say this will be a welcome and long-awaited change would be an understatement. From high school through college, Chile’s education system is the most expensive in the world. This is a legacy of Chilean dictator Augusto Pinochet, whose reforms dismantled public education and replaced it with a market model that privatized many institutions, forcing families to pay out of pocket. As a result, many students cannot afford to graduate, and even those who attain degrees seldom earn enough to pay off their debt. But Chile’s new direction wasn’t conceived by a new slew of politicians in government offices. It started with students in the streets. Demonstrations began in 2006 during the Penguin Revolution, so named because of the black and white uniforms worn by students declaring that “education is a human right.” Students achieved minor tangible victories, but their ultimate goal of free education remained elusive. Protests erupted again in May 2011 with an eight-month long occupation of college campuses. This escalated into a sustained, three-year nationwide movement. At its peak, 800,000 students flooded the streets and enjoyed support from 81% of the population. Finally, Chile's 30-year failed experiment with free-market education came to a close a couple weeks ago when its Congress passed a landmark law ending profits at state-subsidized schools. From Friday, Feb. 27, to Saturday, Feb. 28, the group is hosting their third annual Mapuche Solidarity Film Festival at the Ontario Institute for Studies in Education. There is a suggested donation of $10 per day, but no one will be turned away for lack of funds. There is a wide variety of films on indigenous resistance that scheduled to be screened, with subjects ranging from Six Nations to Cuba to El Salvador to, of course, Chile itself and the Wallmapu struggles. For film descriptions and the full details of the festival, which also includes an opening night reception catered with authentic Chilean empanadas, you can check out the Facebook event, which we’ve linked to here on our podcast page. As reported by Rabble.ca, the worst dressed man in Canadian television drew a social media firestorm after making offensive comments in reference to the indigenous Inuk people of the east coast. For those who haven’t heard by now, Don Cherry’s comments were made to his Hockey Night in Canada co-host Ron MacLean, saying, "What are you, a savage, a barbarian?" when MacLean said he had had a seal meat burger earlier in the day. Listened to in context it is clear these comments were not off-the-cuff, as Cherry says he was aware of what MacLean had eaten prior to going on air. Regardless of how one feels about the seal hunt, calling a food that is closely associated with the Inuit people "savage" and "barbaric" is profoundly wrong and racist. It is his use of these words and this language that matters, given Canada’s thoroughly colonial history. It should not really be necessary to say this, but both calling or in anyway inferring that Native, Indigenous, or Inuit peoples are “savages” or “barbarians” epitomizes colonial, racist attitudes and has a long, terrible, and genocidal history in Canada and North America more broadly. They invited all participants to join them in Waterloo Town Square on Friday evening at 5pm for a candlelight vigil. Candles were provided and people were encouraged to say a few words, make prayers, sing songs, and share the love they felt for the Chapel Hill victims and their own communities here at home. We’re pleased to bring you the full schedule of events for this important occasion, as SFPR is bringing you five days of action and education to raise awareness on the issues Palestinians are facing every day. Want to learn about the segregation, land theft and injustices Palestinians face every day? There will be no shortage of information during the five-day Israeli Apartheid Week. The Award winning documentary, Occupation 101 will be screened in the SLC Great Hall. Filmmakers Abdallah and Sufyan Omeish examine the current and historical root causes of the Israeli-Palestinian conflict, and U.S. political involvement. Every day, Palestinians living in Gaza are faced with surviving under horrendous conditions. After the most recent 50-day conflict, which left over 2000 Palestinians dead, countless more were left homeless to fend for themselves. On this day, SFPR will be taking a few moments to ensure UW and the surrounding community is keeping them in our hearts. Independent Journalist & Film Maker, David Sheen will be present to educate the student body on the ongoing conflict and discuss the current situation.